OpenCloudware: the Cloud application lifecycle management platform - Alexandre Lefebvre, Orange & OW2 and Thomas Debru, UShareSoft. The OpenCloudware collaborative R&D project aims at building an open software engineering platform, for the collaborative development of distributed applications to be deployed on multiple Cloud infrastructures. It will be available through a self-service portal. We target virtualized multi-tier applications such as JavaEE - OSGi. The results of OpenCloudware contain a set of software components to manage the lifecycle of such applications, from modelling (Think), developing and building images (Build), to a multi-IaaS compliant PaaS platform (Run) for their deployment, orchestration, performance testing, self-management (elasticity, green IT optimisation) and provisioning. Applications can be deployed potentially on multiple IaaS (supporting either one IaaS at a time, or hybrid scenarios). The results of the project are gradually made available as open source components through the OW2 Open Source Cloudware initiative. The OpenCloudware project is coordinated by France Telecom Orange, funded by the french Fonds National pour la Société Numérique (FSN) and endorsed by competitiveness clusters Minalogic, Systematic and SCS. The project runs between January 2012 and December 2014. BtrPlace: An Extensible VM manager to face up to SLA expectations in a cloud - Fabien Hermenier, University of Nice Sophia Antipolis and Jean-Marc Menaud, Ecoles des Mines de Nantes. Clients of IaaS providers are looking for dependable infrastructures that can cope with their SLA requirements. To stay attractive, a cloud must then rely on a VM placement algorithm with features matching as possible the SLAs expectations. These constraints are however very specific to each of the tenants but also the infrastructure. They also cover a large range of concerns (reliability, performance, security, energy-efficiency, ...) that are continuously evolving according to new trends and new technologies. Current VM placement algorithms are designed as monolithic systems. Clouds administrators and clients are then passive actors, waiting for the future release of the placement algorithm that may match their current expectations. 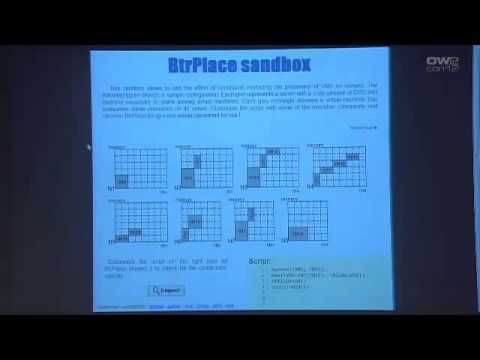 During this presentation, we will present BtrPlace, an open source VM manager that can be specialized on demand by third party developers to integrate new placement constraints. BtrPlace has already been used successfully to address high-availability, security but also energy-efficiency concerns. It has been developped since 2006 in the Mines de Nantes then with the University of Nice-Sophia Antipolis. It is now a part of the OpenCloudware project that aims at building an open platform for the development and the deploymet of distributed application on clouds. 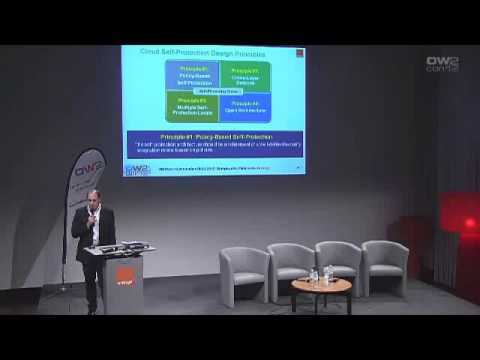 VESPA: Multi-Layered Self-Protection for IaaS Clouds - Marc Lacoste, Orange Labs. Self-protection has raised growing interest as possible element of answer to the cloud protection challenge. Faced with multiple threats and heterogeneous defense systems, the autonomic approach proposes simpler, stronger, and more efficient cloud security management. Previous solutions fall at the last hurdle, overlooking one or several key desirable features such as flexible security policies, cross-layered defense, multiple control granularities, and open security architectures. This talk presents VESPA, an open self-protection architecture and framework for cloud infrastructures that overcomes the previous limitations. Developed in the OpenCloudWare project, VESPA adopts a policy-based management approach, and allows a two-level regulation of security, both within a software layer and across layers. Flexible coordination between self-protection loops allows enforcing a rich spectrum of security strategies such as cross-layer detection and reaction. A multi-plane, extensible architecture also enables simple integration of commodity detection and reaction components. Evaluation results on a VESPA KVM-based implementation show that the design is applicable for effective and yet flexible self-protection of cloud infrastructures. The Sirocco multi-cloud management framework - Frédéric Dang Tran, Orange Labs & Paweł Rubach, Orange Poland While private cloud solutions as well as public cloud service offers are numerous, effective management still remains a challenge where it comes to multi-cloud or hybrid cloud deployment models where applications span several clouds. 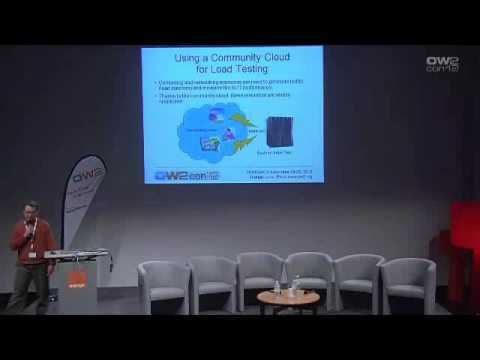 This presentation gives an overview of the OW2 Sirocco multi-cloud management framework with a particular focus on two topics: API mediation and placement management. Sirocco allows consumers to provision resources on multiple cloud providers whether private or public and relies on an orchestration layer that hides the heterogeneity of the underlying providers (in terms of API, virtualization technology...) through a unified user interface and API. Sirocco has adopted the DMTF Cloud Infrastructure Management Interface (CIMI) whose 1.0 release was released on 29 August 2012. Internally, this unified API is translated to the specific API and virtual resource model of each provider. Sirocco currently supports Amazon EC2, VMware vCloud Director as well as OpenStack as back-end clouds. A key component of Sirocco focuses on provider selection and placement management, namely how to select a cloud provider that offers the best match between the client request (QoS, geographical constraints...) and the provider's capabilities. Sirocco integrates a flexible decision-making framework that relies on a rule-based engine. 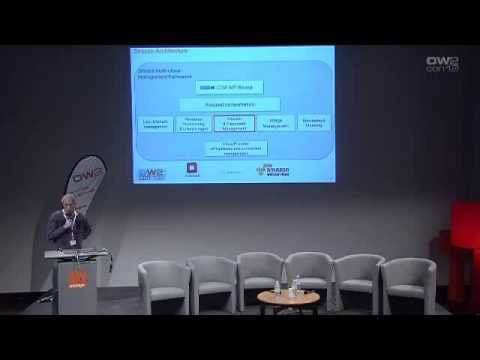 A platform for monitoring Cloud infrastructure and applications - Bernard Boltz, Orange. Various factors introduce specific and new constrains for the monitoring of the Cloud infrastructure and services. For instance, a monitoring tool has to adapt to the quick and elastic provisioning, an important feature of the Cloud. We developed from an open source platform, Icinga / Nagvis, several modules that allow: 1) For the data center infrastructure monitoring - Auto discovery of components of virtualized infrastructures and automatic set-up of their monitoring according to appropriate templates - Dialogue with the VMware API to query, among other things, the status of clusters, resource pools - Maps management in order to drill up or down in the hierarchy of the data center et the virtualized components. 2) For the application monitoring - Management of an applications dashboard that contains a representative set of key performance indicators (KPIs). - Calculation of the indicators - Management of maps showing the links between application and infrastructure. This implementation allows enhanced monitoring. We have also learned the lessons of the experimentation. The presentation will present these modules and limitations encountered. ProActive CLIF: Cloud Enabled Load Injection - Denis Caromel, ActiveEon, Daniel Stern, Orange & Bruno Dillenseger, Orange. 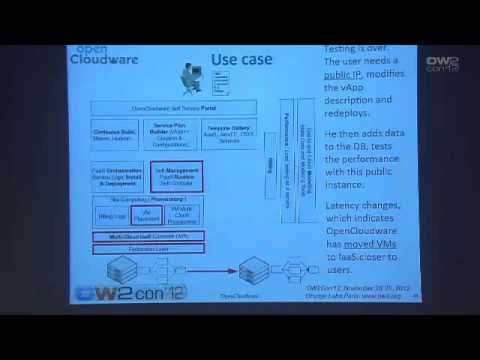 This presentation shows how the 2 OW2 frameworks CLIF and ProActive are successfully used together in order to provide Cloud Enabled Load Injection.